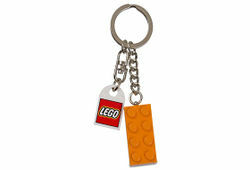 The 852097 Orange Brick Key Chain is a Key Chain set released in 2007. It features an orange 2x4 brick, as well as a LEGO logo printed on a white 2x2 (2x3 top-rounded w/ hole) tile tag, attached to a key chain. Facts about "852097 Orange Brick Key Chain"